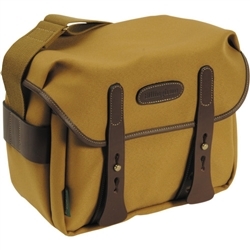 The Billingham f/Stop 2.8 Camera Bag (Khaki with Chocolate Trim) is a bag with a "squared-off" look which is created by the insertion of a pleat on either side of the main flap. There is a secondary, padded lid that is tailored to keep the elements out. The bag is made from FiberNyte with wrap-around interior side padding and a 25mm thick reinforced foam base. There are removable, padded internal dividers with wide, adjustable, touch fastener bands running the length of the bag. A quick release system uses top grain leather tabs with keyhole slots in the straps that engage with the solid brass ClogBalls for fast opening with positive and secure closure.